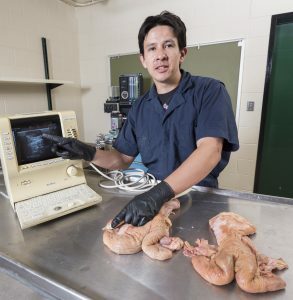 Julian Camilo Ochoa describing reproductive tract of a non-pregnant cow by ultrasound. “My research is mainly focused on the mechanisms involved in the rescue of the corpus luteum in the dairy cow during the maternal recognition of pregnancy. Historically, Dr. Milo Wiltbank’s lab at UW has been at the forefront in producing cutting-edge research in the area of dairy cattle reproductive physiology. For this reason, since the very beginning of my career, I wanted to be part of his team.